Paxos is a small Greek Island. Whilst it is a great place to relax after a few days I had to get out and explore this wonderful island. 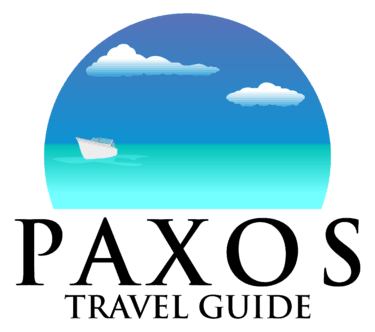 This website is called Paxos Travel Guide. And in this post I will describe getting around the island. Well how I got around this lovely Greek Island. I might even show you some photos from my travels. I love the fact that the island is so small that I can get around most of it and get to see nearly everything I wanted to see. There are various ways of getting around Paxos which I will list here, before describing each one in turn. There is one public bus on Paxos, which I can heartily recommend a trip on. The service is excellent, and you get great views from being higher up than in a car. We chose to sit at the front of the bus to really enjoy the experience and views driving around Paxos. The highlight of the bus trip for me is the bit where you go along the waterfront in Loggos – this is something you have to see to believe! Whilst everyone says small change is essential for the bus we did not have a problem getting change from the very nice lady. Here is a photo of the bus timetable taken in 2017. I do not have the timetable for 2019 yet – all you need to know is that they are displayed clearly at every bus stop, along with the taxi drivers’ names and numbers. Getting the bus is a great of getting between Loggos, Lakka and Gaios. And of course, it means that you can have a cheeky drink, which I did regularly!! Hiring a car is nice and easy. As with all things in busy times book in advance and you won’t have any problems. I have written a separate post all about this called Paxos Car Rental – Everything You Need To Know. Driving around the island of Paxos is a lovely experience, and one that I enjoyed tremendously. The best bit for as a photographer and someone who loves finding places was the side roads off the main roads down to the beaches. There were all sorts of fascinating views and things to stop and look at. This of course is the beauty of having a car – you have the freedom to go wherever you want whenever you want. The roads are not at all busy – the main things to be aware of are the following. Tourist drivers – I count myself as one of these. You can tell locals from tourists in an instant! Just keep your eyes on the road and be aware of other drivers. Large wagons and buses. This was a surprise to me – a large wagon driving from Gaios to Lakka certainly surprised me and reminded me that I need to be way over to the left! Unusually parked vehicles. I did come across the odd vehicle parked in less than convenient places on my travels around the island. The one-way system in Gaios. This takes you through some fairly narrow roads with in the middle of the town – another thing to be aware of. Steep roads. I nearly got stuck trying to get back up the hill from Erimitis Bay Beach – make sure that you can get back up a road that you are going down before you do so! The taxi service on Paxos is excellent. At busy times make sure you book in advance. Name and numbers of the taxi drivers are below, and are also displayed on bus timetables in the main towns of Loggos, Lakka and Gaios. Prices are perfectly reasonable, and the service is very reliable. The drivers are lovely and friendly, the cars are nice and clean. All good basically – book early whenever you can. Taxis also pick up and drop off at the bus stop in Gaios, right by the main car park and the Paxos Market. This is one of my top thing things to do on Paxos. I have written a post titled Should I drive a hire boat to Antipaxos from Paxos? which introduces this subject. I will also be writing a separate post all about a day on a hire boat going from Paxos to Antipaxos. And back! You can of course rent a boat and just pootle around – you don’t have to go to Antipaxos. There are lots of great little coves, beaches and cliffs to explore whilst staying in the waters of Paxos itself. Yep I loved walking around the island, be it from my hotel to remote places or parking the car then just going off exploring. If you are going to use your phone for navigation a word of warning – the mobile phone signal can drop off quite dramatically. I had trouble finding the magnificent Tripitos Arch as the phone signal just died on me, leaving me walking around in circles staring at random directions. If you like walking buy a map – I am quite ashamed that I did not do this, especially with me being trained in all these things when I was in the scouts some years ago granted. And my other top piece of advice – take water – don’t do what I did, which you can view on this short video on my Paxos Travel Guide YouTube channel. Swimming on Paxos is lovely. I often was joined on my sunrise shoots by locals enjoying an early morning swim. It was a surprise to me that quite often this was skinny dipping though!! Quite a shock when I am trying photograph and video the sunrise I have to say! The waters are lovely and clear outside of the main harbours of Lakka, Loggos and Gaios by the way. No I am not saying swim from one place to another, not unless you are a strong swimmer and have a really good waterproof bag! If you have travelled with tour operator on a package holiday you will of course be offered excursions. I strongly recommend the day trip to Paxos – we did this the first time we came to Paxos and all it did was make us want to come back. TUI and Olympic Holidays offer holidays and excursions on Paxos. Beyond that many hotels can assist with trips out. We found the best way was just to walk around the three main towns of Lakka, Loggos and Gaios and see what was on offer. There are various places offering trips around the island and from Gaios to other islands. You can hire these from various rental places in Loggos, Lakka and Gaios. I know it would be nice to list the places on this post, but a lot of them do not have their own websites, so a list would not be complete. I assume that if you are going to Paxos you will be visiting at least one of the three main towns at some point – all you need to do is walk around and you will find what you are looking for. To summarise getting around the Greek Island of Paxos is easy and an absolute delight. My favourite bits were renting a boat and also exploring the lesser known parts. How to get around Paxos? Any way you want – just enjoy it like I did!! Next PostNext Paxos Hotels With Pool – Essential For The Hot Summer Months!